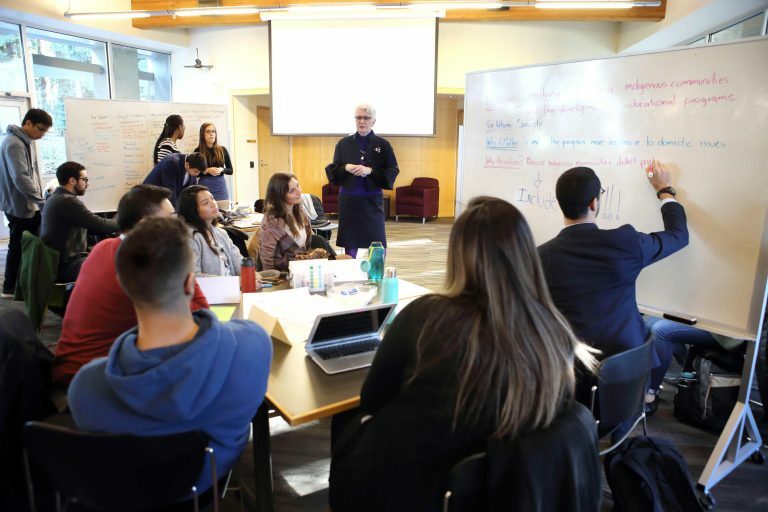 The Policy Studio is a university-wide endeavor which focuses on finding innovative solutions to complex, systemic, or resilient problems through the use of the strategic design method. It integrates disciplinary and interdisciplinary expertise from across UBC faculties and departments. The Policy Studio is based at the Liu Institute for Global Issues, part of the UBC School of Public Policy and Global Affairs (SPPGA). Is public good oriented, incorporating an international and global focus. The Policy Studio is built on the strategic design method – a participatory process rooted in user research where at its best, multi-disciplinary teams blend creative and critical-thinking techniques to explore, co-create, prototype, and launch resilient solutions to big picture challenges. 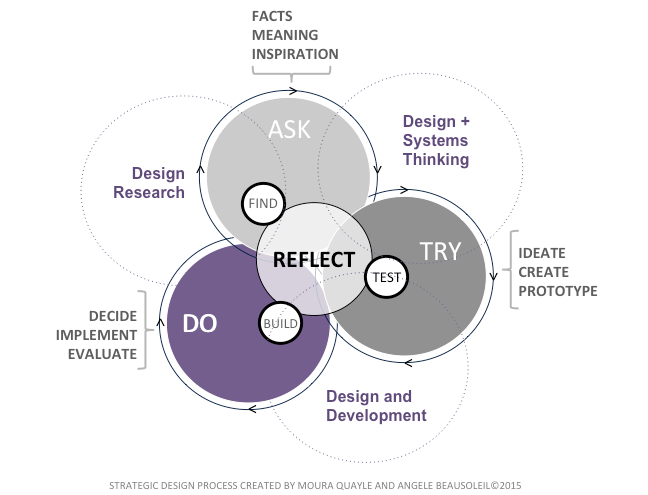 The Strategic Design method was developed first in the d.studio of UBC – Sauder School of Business and then successfully extended to university wide interdisciplinary projects inside and outside the academic domain. Currently, the strategic design methods serves both the Policy Studio (Arts & Social Sciences) and the d.studio (School of Business) at the University of British Columbia. The strategic design method integrates three key distinctive phases, the ASK phase relates to problem understanding, analyzing cause, symptoms, and consequences of a certain identified problem and incorporates diverse disciplinary approaches for a thorough analysis. It focuses on user-centred understanding of experiences to capture both observations and insights. This phase aims to develop empathy with the current and potential user of a service to generate preliminary options that will be tested or piloted in the TRY phase. This second phase focuses on deeper exploration of options, scenarios, and draft proposals; it includes a series of lean or fast prototypes responding to the needs of having researchable models to test and compare. The third phase known as DO deals with the decision making, implementation and evaluation of the outputs, product, service, or policy. All the phases incorporates a deep dive of problem understanding, innovation intents, and reflection time throughout a whole iterative process. The strategic design method is a highly participative oriented pedagogy, it engages participants with a variety of stakeholders including academics, thematic experts, users, and representatives from the diverse body of stakeholders. The flexibility of the application of the method makes it suitable for a short period “challenges”, or a full undergraduate or graduate course. Moura is the founding Director pro tem of UBC’s new School of Public Policy and Global Affairs and is a Professor in the Sauder School of Business. Moura’s interests lie in rethinking, refining and rebuilding collaborative spaces at the intersections of academia, government, business and civil society. Learn more about her work on her SPPGA Profile. Marcelo is the Policy Studio research lead. His research looks at co-designing inter-sectoral partnerships amongst academia and stakeholders through knowledge mobilization processes, to maximize the impact of knowledge and research. In recent years, he has worked with Moura Quayle to develop the Policy Studio, seeking to extend the scope of the strategic design method and its applications in the public realm in Canada and abroad. Marcelo has experience working in social policy, NGOs, civic groups, and academic institutions in three countries. He brings a unique international, pedagogical, interdisciplinary and cross-disciplinary experience to policy and complex problems. Marcelo holds a Master in Prospective Studies and Strategy at Tec de Monterrey – Graduate School of Public Policy, Mexico, and has completed his PhD in Interdisciplinary Studies (Policy and Social Innovation), at the UBC Interdisciplinary Studies Graduate Program. An intensive 3 day program for students from the Master of Public Policy and Global Affairs and federal public servants from Energy and Sustainability agencies. It focused on energy consumption analysis (citizens level). The program was hosted in 2016 at the Innovation Hub site, part of the Privy Council Office in Ottawa. A collaboration with UBC – VPRI (Research & Innovation). 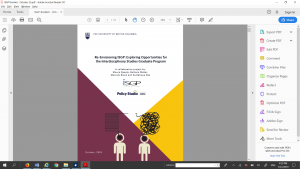 This research project was designed to understand the nature and impact of UBC’s professors working in knowledge mobilization activities, mainly in the policy realm. Researchers organized studio sessions, performed interviews, and built case studies. Download the Enhancing KMb@UBC report here. An international project between students from the Master of Public Policy and Global Affairs and Science Po (France). A selected group of graduate programs guided by city experts (academics, public servants and NGO’s representatives) participated in an intensive 5 days program to proposed ideas to foster social connectedness and city resiliency strategies. Download the Resilient Cities Policy Challenge Ideabook here. A customized “innovation pedagogy” problem-based learning component for the Tec de Monterrey international program at UBC. The program collaboration started with summer sessions and has now expanded to both summer and winter sessions. A collaboration with a Mexican academic institution based on a follow-up invitation by a former Mitacs Globalink UAM student and the Facultad de Ciencias para el Diseño UAM- Azcapotzalco. It consisted on a Book presentation, studio work and collaborative sessions both with students and faculty. A collaboration with UBC – VPRI (Research & Innovation), this was a continuation to the Enhancing KMb@UBC research now seeking to integrate inputs from a variety of UBC external partners and publics. Results of this research supported the creation of a forthcoming UBC Knowledge Exchange Kx Office. 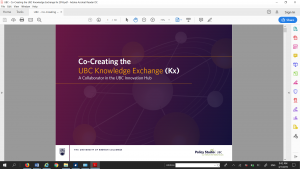 Download the Co-Creating the UBC Knowledge Exchange. A collaborator in the UBC Innovation Hub report here. 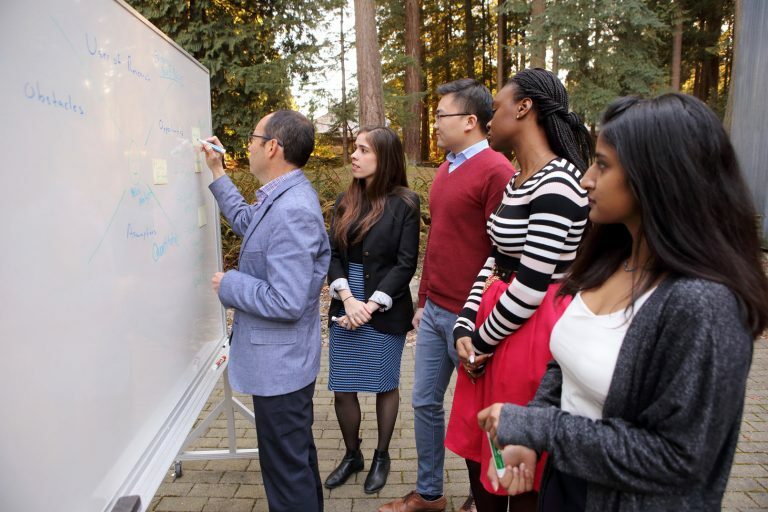 A project for the UBC – ISGP Interdisciplinary Studies Graduate Program focused on working with graduate students, faculty, and alumni. It served to design future scenarios and strategies for ISGP to maintain its current and future leadership in interdisciplinary education; and to update its role as a unique academic innovator unit.